Our commitment to our clients goes beyond the normal hours. Our team is available 24 hours a day. We are fluent in English, Spanish, Portuguese, Greek, and Korean. Our goal is to satisfy every client. 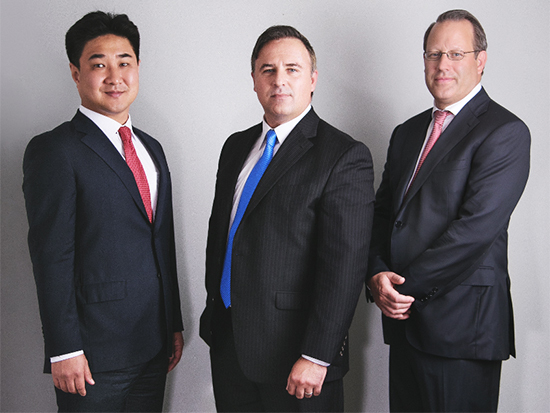 Attorney Leonidas Chakalos has selected a team to provide his clients with experienced and reliable services. Our Office Manager has more than 20 years experience in the Personal Injury field. He is fluent in Spanish and has built a client base that continues to use our services year after year. He monitors each case and makes sure that each client receives the attention they deserve. Our Senior Paralegal has more than 15 years experience in the Real Estate Closing and Litigation areas. She supervises the Real Estate Closing Department and makes sure that each Real Estate Closing is conducted in a smooth, efficient, and timely manner. Please visit our Real Estate Division at www.apextitleservices.com. Leonidas Chakalos, Esquire is the sole managing partner of Chakalos & Associates, LLC and founder of Apex Title and Closing Services. He is a 1994 graduate of Keene State College where he received a Bachelors of Science Degree in Business Management. Attorney Chakalos received his Juris Doctorate from Suffolk University in 2000. He is a member of the state and federal bar of the Commonwealth of Massachusetts and the state bar of New Hampshire. Attorney Chakalos’ practice focuses on Civil Litigation. He has handled numerous complex civil matters including Motor Vehicle Accidents, Slip and Fall Accidents, and numerous other injury matters. In addition, Attorney Chakalos represents Buyers, Sellers, and Lenders in residential and commercial Real Estate Transactions throughout Massachusetts and New Hampshire. He is a Real Estate Broker and Title Insurance Agent for Old Republic National Title Insurance Company. Craig S. Stelmach, Esquire has more than 17 years of technology industry experience, including over 14 years as in-house counsel, and has significant expertise and experience in business consulting & strategy, financing, transactional analysis, technology and entrepreneurship, small business formation and consultation, and real estate analysis and negotiation. Attorney Stelmach also has significant operational experience and is able to help companies find their footing and navigate successfully during periods of rapid growth. Throughout his career, Attorney Stelmach has lent his legal and operational expertise to companies like Berkeley Communications, ADrive, Vector Data, Omni Ventures Group, Google, ITA Software, Boston Microfluidics, Inch of Daylight, and many more in a variety of markets.Craig’s mission is to provide exceptional counsel and service to his clients. Wooseok Gio Chang, Esquire practices at Chang & Associates, P.C. in Burlington and represents plaintiffs in civil liability & litigation matters. He graduated from the University of New Hampshire, School of Law (f/k/a Franklin Pierce Law Center) in Concord, New Hampshire. He concentrates his practice in Immigration, Personal Injury, Contract Disputes, Debt Collection, and Bankruptcy. Attorney Chang is admitted to practice in Massachusetts, New York, and Federal Court in the District of Massachusetts. He is involved with the Korean American Society of N.H. Inc., Justice for Our Neighbor (JFON), the International Business Collaborative Association (IBCA) since 2008, and is initiating a network for New England lawyers to serve the community better.